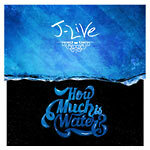 J-Live's twelfth studio album ''How Much Is Water?'' challenges listeners to consider how much music is worth in today's landscape. J-live experiments with various modern styles of production and enlists double time rhyme schemes that he hasn't incorporated since the days of the classic single ''Them That's Not'' from his debut album ''The Best Part.'' J-Live maintains the balance with his signature boom-bap ethic, jazzy eclectic samples, and thought-provoking lyrics. 9. How Much Is Water?